New T@DA Trailer Tent is ready for order! We know many of you have been patiently awaiting the release of our T@DA Trailer Tent – and we are pleased to say that we are now taking orders and producing this item in our Poway, CA Shop! Double the amount of protected, livable space with our 12′ x 7.5′ shelter. Click on the photo, or call us toll-free at 888.700.TENT (8368) for more information and to orders yours today! The night sky tonight and on any clear night offers an ever-changing display of fascinating objects you can see, from stars and constellations to bright planets, often the moon, and sometimes special events like meteor showers. Observing the night sky can be done with no special equipment, although a sky map can be very useful, and a good beginner telescope or binoculars will enhance some experiences and bring some otherwise invisible objects into view. You can also use astronomy accessories to make your observing easier. Below, find out what’s up in the night sky for the month of May. The First Quarter Moon rises around 1 p.m. and sets around 2:15 a.m. It dominates the evening sky. This is the best evening apparition of Mercury this year for observers in the northern hemisphere. Use Venus to help you locate it. Mercury is most easily located by sweeping with binoculars, but once you’ve located it, you should be able to see it with your unaided eyes. The shadows of Io and Ganymede will be on opposite limbs of Jupiter, while the moons Io and Callisto will be central on the disk. Saturn will be in opposition to the sun. Note how most of Saturn’s moons are in the same plane as the rings, except for Iapetus, whose orbit is tilted 8.3 degrees. At opposition, Iapetus is close to maximum elongation towards the west, while Titan is close to maximum elongation towards the east. The shadow of Io chases the shadow of Ganymede across the face of Jupiter, catching up with it and passing it at 11:48 p.m. EDT. 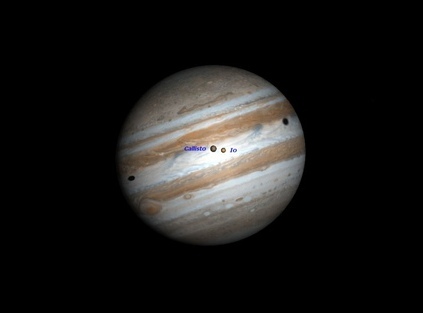 The Great Red Spot will also cross Jupiter’s disk during this period. Mercury is well placed for northern hemisphere observers in the evening twilight sky for the first three weeks of May. Venus shines high in the western sky after sunset. Mars moves from Aries to Taurus on May 3, too close to the sun to be visible. Jupiter is well placed in the evening sky all month. Saturn is just north of Scorpius’ “claws.” At opposition on May 22, it is visible all night. Uranus rises just before the sun in Pisces. Neptune is in the eastern morning sky in the constellation Aquarius. Asterism: A noteworthy or striking pattern of stars within a larger constellation. Degrees (measuring the sky): The sky is 360 degrees all the way around, which means roughly 180 degrees from horizon to horizon. It’s easy to measure distances between objects: Your fist on an outstretched arm covers about 10 degrees of sky. Visual Magnitude: This is the astronomer’s scale for measuring the brightness of objects in the sky. The dimmest object visible in the night sky under perfectly dark conditions is about magnitude 6.5. Brighter stars are magnitude 2 or 1. The brightest objects get negative numbers. Venus can be as bright as magnitude minus 4.9. The full moon is minus 12.7 and the sun is minus 26.8. Terminator: The boundary on the moon between sunlight and shadow. Zenith: The point in the sky directly overhead. Adjust to the dark: If you wish to observe faint objects, such as meteors or dim stars, give your eyes at least 15 minutes to adjust to the darkness. Light Pollution: Even from a big city, one can see the moon, a handful of bright stars and sometimes the brightest planets. But to fully enjoy the heavens — especially a meteor shower, the constellations, or to see the amazing swath across the sky that represents our view toward the center of the Milky Way Galaxy — rural areas are best for night sky viewing. If you’re stuck in a city or suburban area, a building can be used to block ambient light (or moonlight) to help reveal fainter objects. If you’re in the suburbs, simply turning off outdoor lights can help. Prepare for skywatching: If you plan to be out for more than a few minutes, and it’s not a warm summer evening, dress warmer than you think necessary. An hour of observing a winter meteor shower can chill you to the bone. A blanket or lounge chair will prove much more comfortable than standing or sitting in a chair and craning your neck to see overhead. The most important piece of equipment for a camping trip is your First Aid Kit. I’ve made some suggestions below for a “Fabulous First Aid Kit” that will help make your trip more enjoyable, rather than having to rush to a doctor’s office. It’s always best to include a First Aid Manual and familiarize yourself with some of the basic procedures. Remember that cuts should have firm pressure put on them before bandaging, to help stop the flow of blood. If bloodflow cannot be stopped, it’s time to get to a hospital pronto. Place the affected area above the heart while transporting the patient. NEVER place any creams or oils on burns. Always use cool water and wrap with a loose gauze bandage until you can see a doctor. Ace bandages are great for sprains; use a painter’s stir stick and wrap against the sprain if you suspect a broken bone. No walking on a suspected broken ankle! Fevers can be lowered with analgesics and a cool wash cloth to the head. Drink plenty of water when camping (not just beer! ), as being outdoors can dehydrate you quickly. Always bring water bottles on hikes. Happy Camping and enjoy the outdoors! We are very pleased to have Anita Hudson Easton back on our writing staff as author of our monthly Gear Doctor. Anita is a 30 year veteran of the Outdoor Industry and is an expert in the design, manufacturing, care and maintenance of outdoor gear! I love these. And they’re quite simple to make, even with the extra step of grilling the potatoes first. But that’s important here. 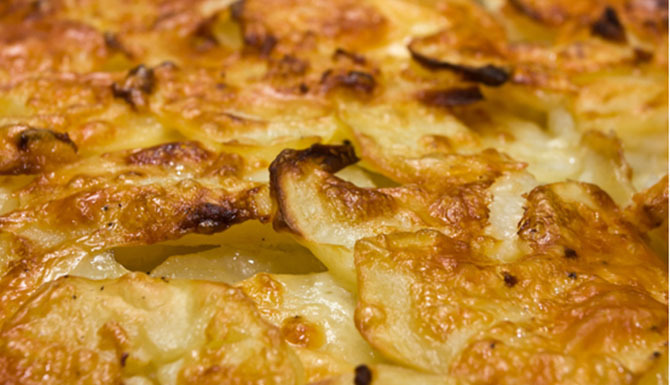 Grilling the potatoes takes an ordinary batch of scalloped potatoes to a new level with that coveted grilled/smoked flavor we all love. And while I don’t usually use ANYTHING out of a can, making cream of mushroom soup from scratch is a bit of a long process, so taking some help from the store here is OK in my book. The other way is to make up individual foil packets. This batch size will be about 8 servings. Just tear 8 pieces of foil about 10 inches long and evenly distribute the grilled potatoes and soup mixture into each one. Top with butter and close to seal. Same cook time. Done!